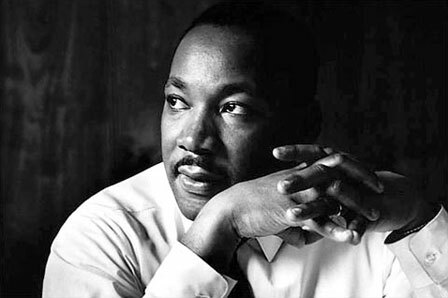 “I had a dream…” Martin Luther King, Jr.
Michael Luther King, Jr. was born on this day in Atlanta, Georgia, USA in 1929. Today is the 84th anniversary of his birth. Born to into a “preaching” family. Both his father and grandfather were Baptist ministers. His maternal grandfather, A.D. Williams took over the Ebenezer Baptist church in Atlanta when its congregation numbered only 13. Under his leadership that quickly changed. King’s father married Alberta Williams (A.D.’s only surviving child) in 1926. Martin was the middle of three children in the King household. He grew up in Atlanta attending Booker T. Washington High School. He entered Morehouse College at age fifteen. He graduated from Morehouse in 1948 and went on to get his Bachelor of Divinity degree at Crozer Theological Seminary in Chester, PA. and his Doctor of Philosophy from Boston University. The “Sit-In” movement began in 1960. By summer 27 sit-ins had successfully ended lunch counter segregation. King joined an Atlanta lunch-counter sit in and was arrested with 36 others. On August 28, 1963 King and his supporters marched peacefully to the Lincoln Memorial in Washington DC and he gave his “I Have a Dream” speech. The Civil Rights Act passed 1964. The same year King received the Nobel Peace Prize. 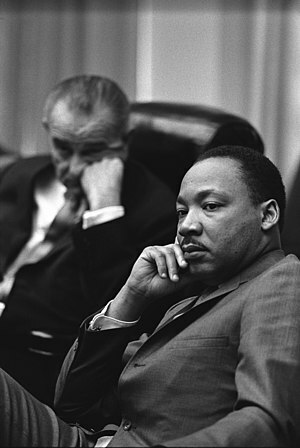 King continued to advocate for civil rights. He saw the passage of the Voting Rights Act in 1965 and worked to bring the Civil Rights Movement to larger cities. He also added his voice to the chorus of protesters against the Vietnam War. In the spring of 1968 King went to Memphis, Tennessee to support sanitation workers who were on strike. This entry was posted on Tuesday, January 15th, 2013 at 9:46 pm	and posted in African-American, American History, Jr, postaday, Thought of the Day, Today's Birthday, United States. You can follow any responses to this entry through the RSS 2.0 feed.